Released on: October 2nd, 2018. At the time of its release, William Friedkin’s The Exorcist was the most profitable film in Warner Brothers history. It made perfect sense then, to produce a follow up picture, even in the wake of the countless knockoffs that had hit theaters after the success of the original. What didn’t make sense, at least not from a financial standpoint, was what director John Boorman delivered. Essentially given free reign on what was then the most expensive production that Warner Brothers had ever launched, his ‘sequel’ was less a horror picture than it was a borderline surrealist take on spirituality and hypnosis. Audiences were less than impressed and the picture was savaged by critics across the globe – not a good thing for a movie that launched simultaneously in hundreds of theaters. 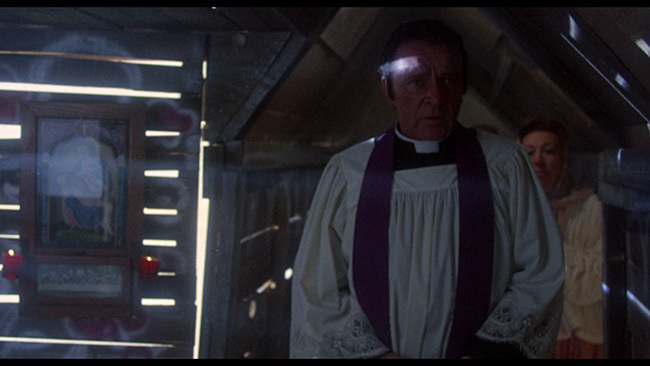 In the opening scene, Father Philip Lamont (Richard Burton, who would play a priest again the following year in Absolution) does his best to exorcise a possessed woman in Africa who claims that she can heal the sick. When a candle gets knocked over and her dress catches fire, she dies in the process. 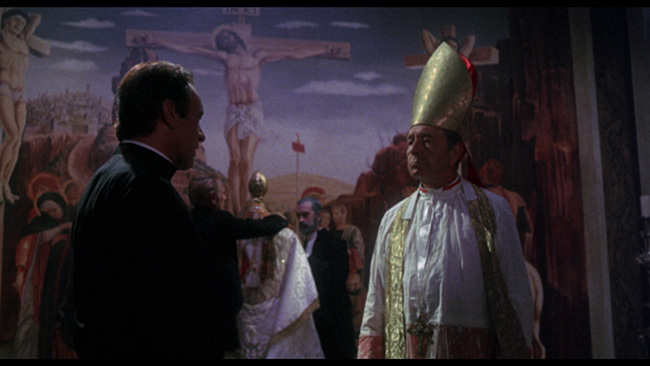 Lamont returns to American soil where the Cardinal (Paul Henreid in his final film role) assigns him a new task – he’s to investigate the death of Father Lankester Merrin (Max Von Sydow) that occurred in Washington four years prior. 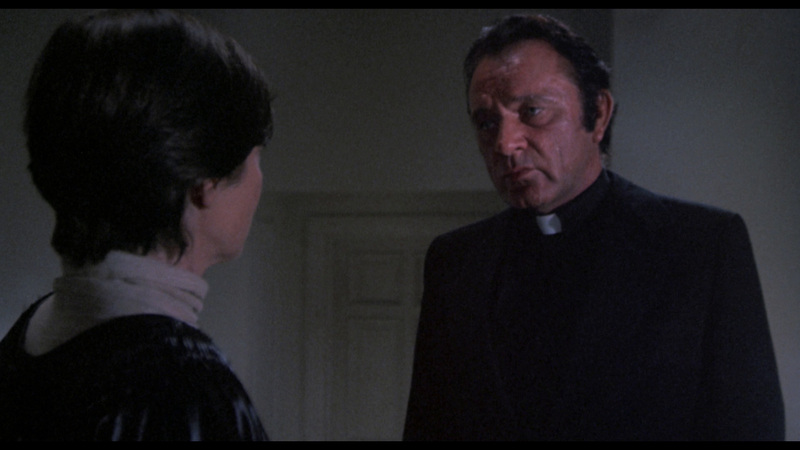 Lamont was Merrin’s protégé, we’re told, and his familiarity not only with the rite of exorcism but with Merrin’s life make him the right man for this job. Why is Merrin being investigated? He’s being charged with heresy for his writings which are now in conflict with the church’s stance on the existence of the devil. 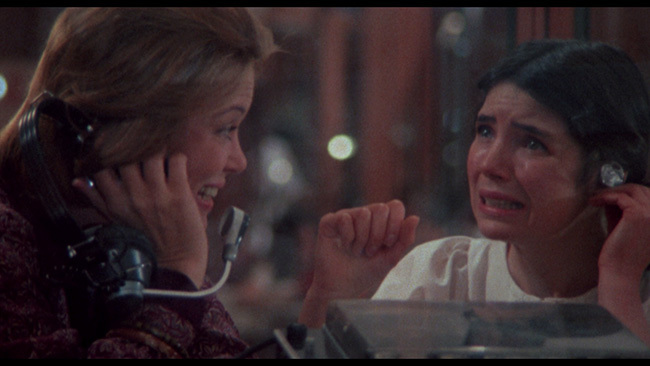 Lamont’s quest brings him to New York where Regan MacNeil (Linda Blair) is receiving therapy from Dr. Gene Tuskin (Louise Fletcher) who insists on using an experimental device called a Synchronizer on her patient. Regan claims to remember nothing about her previous possession and subsequent exorcism, but Tuskin is certain that those memories are there. The Synchronizer will allow Tuskin to link her brain to Regan’s and, while she is under hypnosis, basically explore her brain. Meanwhile, Lamont travels to Georgetown to visit the scene of the original crime thanks to some help from Regan’s caregiver, Sharon Spencer (Kitty Winn). 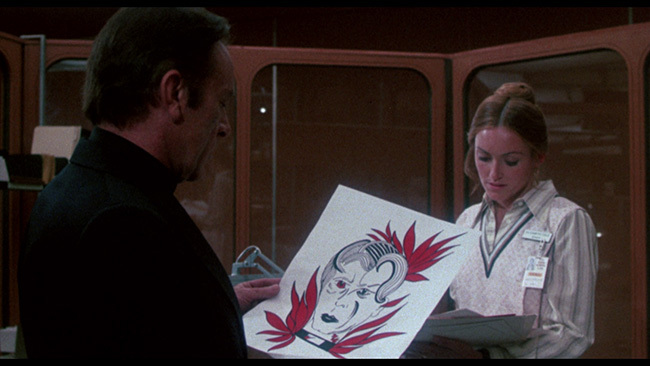 Upon his return, he’s allowed to ‘synchronize’ with Regan where he envisions a younger Merrin exorcising the demon Pazuzu from an African boy named Kokumo. 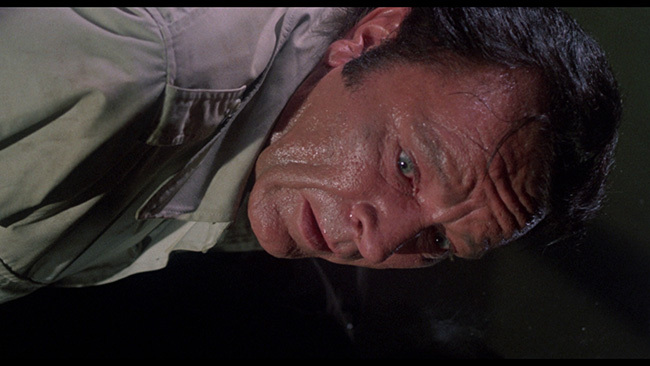 Armed with this knowledge, Lamont heads to Africa to visit with the adult Kokumo (James Earl Jones), who is now a scientist studying locusts – the form that the demon Pazuzu now seems to prefer to take. Things get even stranger from there. The Exorcist II: The Heretic is a fascinating disaster of a picture. It is nothing, if not ambitious, and it has moments where greatness really and truly does shine through but the convoluted production history combined with a director indulging his own personal flights of fancy resulted in a truly bizarre film that understandably left those expecting pea soup vomit and spinning heads wondering what on Earth they’d just watched. Ennio Morricone’s amazing score for the film almost makes up for a few of the film’s most grievous missteps, but there’s really no getting around the fact that this picture, for all its legitimately cool moments, never comes together the way that it should. 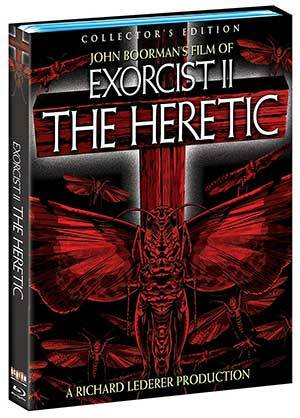 Even if you don’t judge the picture as a horror film, which is no doubt what Boorman, who had made the equally maligned but lovably bizarre Zardoz prior to this effort, would prefer (he reportedly refers to the film as The Heretic and not as The Exorcist II), there are issues. The insistence of putting tap dancing scenes into an otherwise straight-laced and serious picture is lamentable while Burton’s tendency to repeat lines twice, presumably for dramatic effect, is laughable. The plot throws in everything but the kitchen sink, working in a few token references to the original and some moderately spooky imagery from time to time, and then we’re flying through the air with the giant locusts and watching James Earl Jones do whatever it is exactly that James Earl Jones is doing in this movie. The picture is theologically confusing and it relies on some rather shaky science, never properly establishing the conflict that should exist between the two points of view in any reasonable way. The film also posits some strange sexual overtones to the relationship between Regan and Lamont, suggesting an attraction between the two but never really resolving this in any way. And yet, there’s something about the movie. It’s watchable, and not really in an ironic ‘bad movie’ sort of way (tap dancing scenes notwithstanding). The visuals are, as they tend to be in Boorman’s best films, more than impressive. 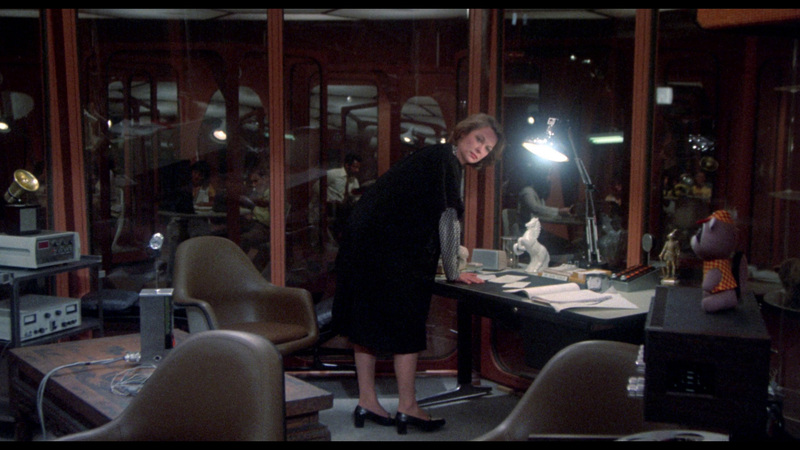 The use of mirrors in the film in particular does a great job of keeping us on edge and allowing for some interesting camerawork. The effects set pieces are well done, even if sometimes miniature work is clearly just that, and the scenes wherein the Synchronizer are used are both tense and fascinating to watch. The performances are strong pretty much across the board. If Blair can’t tap dance, she can act and she’s genuinely good here. 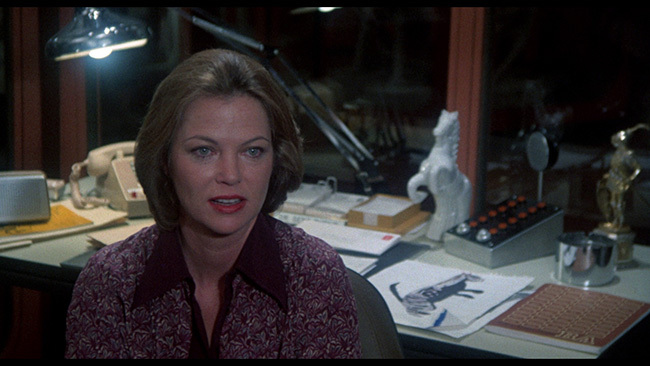 Obviously, a few years older than she was in the first picture, she’s likeable and attractive and we can see why Lamont would be drawn to her, particularly as the film does establish that he is wrestling with the issue of his own wobbly faith. Burton, likewise, brings his inimitable screen presence to the picture in a big way. His delivery might feel a little old fashioned for a film like this but he’s good in the part, even if some of the dialogue written for his character is clunky. Max Von Sydow is excellent in everything he does and this picture is no exception to that rule, while Kitty Winn is fine in her part as well. Fresh off of an Oscar win for her role as Nurse Ratched in One Flew Over The Cuckoo’s Nest, Louise Fletcher is a fine choice to play Regan’s therapist and she does a great job here. As confusing and misguided as it all is, there’s a clear intent with this picture to do something different. What Boorman and company accomplished was definitely that, even if the end result is a bit of a mess. Note that Shout! Factory has included the original 118-minute cut of the film that first played theaters and, on a second disc, the 102-minute recut version (but not the first recut version that Boorman did himself that ran 110 minutes) referred to on the packaging as the home video cut. There are some big differences here – the opening credits are changed, Lamont gives a narrated intro in the shorter cut, the first tap dancing scene has been excised and some of the early hypnosis scenes have been rearranged. Additionally, Lamont’s fate at the end of the movie is different (no spoilers!). Honestly, the shorter version is not a better version even if it does make a few changes that might make it more appealing to those looking for a ‘traditional’ horror film, but it’s great to have it included here as a curiosity item particularly as this is the way that so many of us first saw the film. 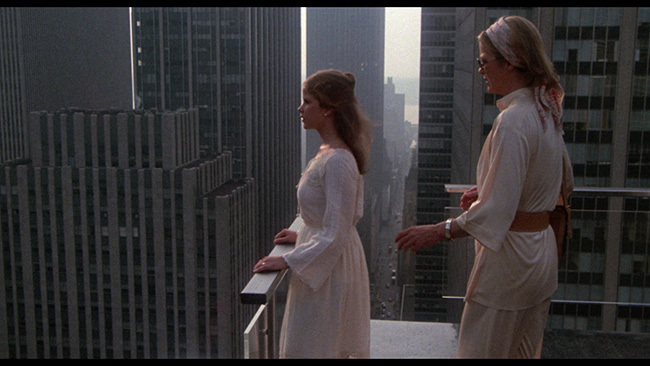 Each version of The Exorcist II is given its own 50GB Blu-ray disc and is presented in AVC encoded 1080p high definition framed in its original theatrical aspect ratio of 1.85.1 widescreen. Both transfers are noted as being taken from a ‘new 2k scan from original film elements’ although exactly what those elements are isn’t stated. Regardless, the video quality here is fine, particularly when you consider how much Boorman put up there on the screen in terms of smoke, fog, slow motion, layered special effects shots and weird lighting effects. This results in some softness being inherent in the look of the film, but the Blu-ray presentation handles this well enough. Detail is solid without ever melting your eyes and the picture is nice and film-like, showing plenty of natural grain but little actual print damage. Compression isn’t a problem, the bit rate is pretty high here and the image is free of obvious noise reduction and edge enhancement issues. Color reproduction looks fine and black levels are good as well. To summarize, this is a good transfer of some tricky material. Audio chores are handled by a DTS-HD Mono track, in English and with optional English subtitles available. The quality of this mix is fine. Some might lament the absence of a surround track, which might have been pretty cool, if done right, given how crazy some of the scenes in the movie are, but there’s no faulting Shout! Factory for going with the original mix. Dialogue is always clean, always clear and the track is free of any hiss or distortion. The levels are balanced well and the score sounds surprisingly punchy in spots. Effects are also handled well here, for a single channel mix it does a nice job of filling the room when those locusts appear. Extras on the first disc start off with a commentary track from director John Boorman. This one starts off pretty strong but weakens as it progresses. Boorman seems reluctant to discuss the almost entirely negative reception that the film received when it first played theaters, instead talking about his intentions in certain scenes, how specific set pieces were set up and what it was like working with the cast assembled for the picture. Unfortunately, he runs out of things to say in the last half of the film, which results in some occasional long gaps of silence and stretches where he simply tells us what we’re looking at on screen. Still, for archival purposes, this track is an important one. A second commentary features home video consultant and writer Scott Michael Bosco, webmaster of thedigitalcinema.info website. Bosco’s track is very well-researched, going into quite a bit of detail about the different cuts of the film that exist (and why they existed) and their differences as well as offering some interesting insight into the elements of Christianity and Islam that are worked into the story and the symbolism. He also does some interesting deep dives into the film’s themes, exploring them and explaining them quite nicely and, as the track progresses, offering his own opinions on what works and what doesn’t in the picture. This track is very fact-heavy and, from a historical perspective, quite interesting – in fact, there are times where Bosco has more to say about Boorman’s involvement in the production than Boorman himself does on his track. After that, check out two new interviews, the first of which is with Linda Blair and is entitled What Does She Remember? Here, over the course of nineteen-minutes, the jovial actress talks about what it was like revisiting her iconic character from the first film, how the script that she agreed to was changed quite drastically over the course of the production, her thoughts on Boorman’s directing of the picture and, of course, her interactions with Richard Burton. Blair is clearly well-aware of how the film is regarded and is able to laugh off a lot of the criticism and is quite upfront about her feelings on all of this. 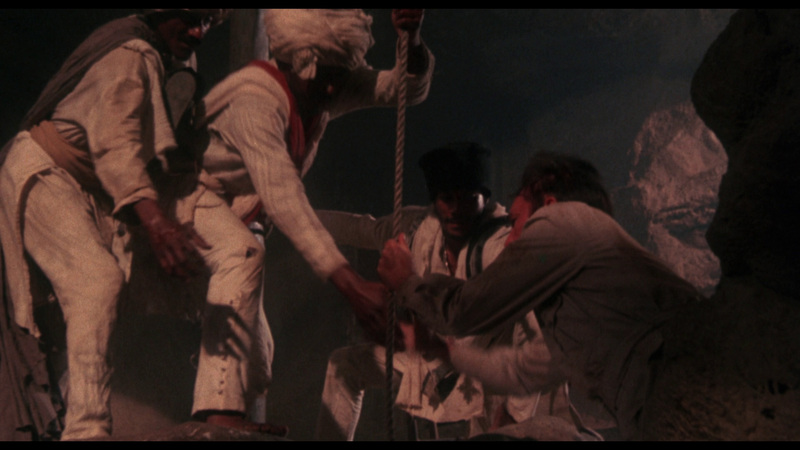 After that, editor Tom Priestley spends seven-minutes discussing how he wound up taking on this project after completing Voyage Of The Damned, working with Boorman and some of the difficulties involved in completing the project. The supplements on disc two start off with a commentary track from Mike White, probably best known as the host of the movie podcast The Projection Booth. If you’re familiar with The Projection Booth you’ll already know White’s style, which is sometimes ridiculously detailed. This is one of those times, and the disc is all the better for it. White talks about the different versions of the script that were penned for the movie, the quality of the performances, some of the effects work, Morricone’s genuinely amazing score and plenty more and he does it with a very listenable style and occasional doses of effective humor. If you haven’t yet, and find this film as fascinating as some of us do, check out The Projection Booth’s three-hour episode on the movie here. Rounding out the extras on the second disc are the film’s original teaser trailer, and original theatrical trailer, and still galleries representing a pretty impressive selection of promotional stills, behind-the-scenes photos, deleted scene photos, theatrical posters and lobby cards. Animated menus and chapter selection are included on both discs. The discs themselves fit inside a standard sized Blu-ray case that, for the first pressing at least, comes with a slipcover. Reversible cover sleeve art is also included with Shout! Factory’s newly created art on one side and the original theatrical poster represented on the reverse. 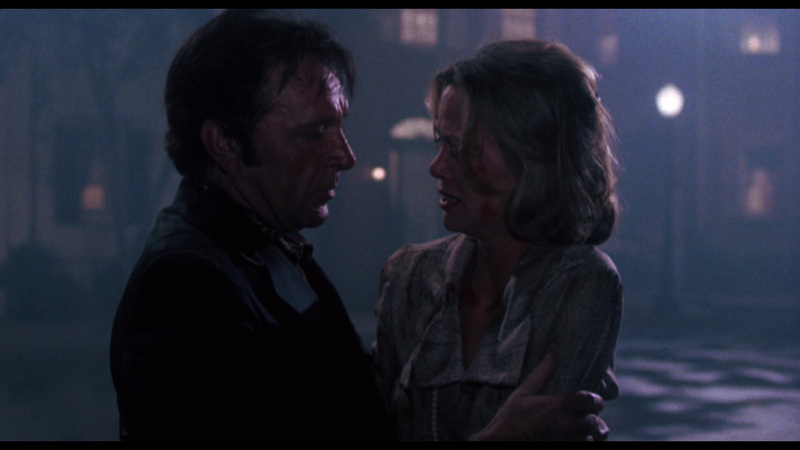 The Exorcist II: The Heretic has its share of obvious flaws but you’ve got to admire the audacity and ambition of the picture. If it isn’t always good, it is a genuinely fascinating film worth revisiting just for the sheer craziness of it all. Shout! Factory has done a very nice job bringing this to Blu-ray, presenting two unique cuts of the film and providing a nice array of extras that document its bizarre history in a lot of interesting detail. Click on the images below for full sized Exorcist II: The Heretic Blu-ray screen caps! I know it's got its fans, but godDAMN do I hate this film. The main reason this film doesn’t work is that it’s really hard for an athiest like Boorman to really grasp demonic possession as a concept, hence the emphasis on the science angles and the lack of it connecting to the theological side of things.
. Darcy has a point. Atheists were also heavily involved in some of the other notoriously worst/excruciating misfires in modern cinema history (all but the last with their own cult of devoted fans): MYRA BRECKINRIDGE, THE LONELY LADY, CAN'T STOP THE MUSIC, NIGHT OF THE LEPUShttps://westgategallery.com/recent-a...e-lepus-german and JUNO. I really hated this film but Ian's review of the special features has me interested in learning more. I do enjoy the stories behind cinematic disasters. You can just watch this haha.